We always try to make a day trip with the family during the Christmas hollidays. It's always nice to do something together in a relaxed way, we all enjoy these days. Last year we visited the China Zoo project in the Antwerp Zoo. You can find a post of it on my blog. This year we decided to visit Winterland in Hasselt. We visited the town first in the afternoon and did some shopping, and in the evening we went to Winterland. It was a nice and beautiful Christmas Market with lots of attractions, beautiful stalls and lights and yummy food. 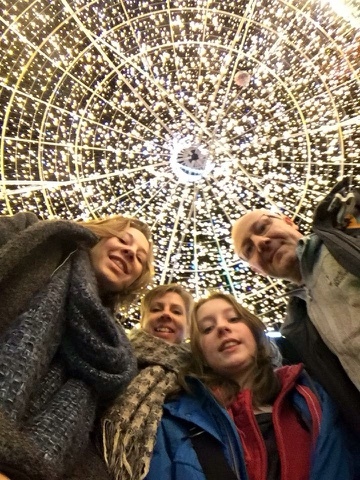 My husband took a formidable family picture in a kind of superlarge Christmass ball full of light. You can see the picture down here. 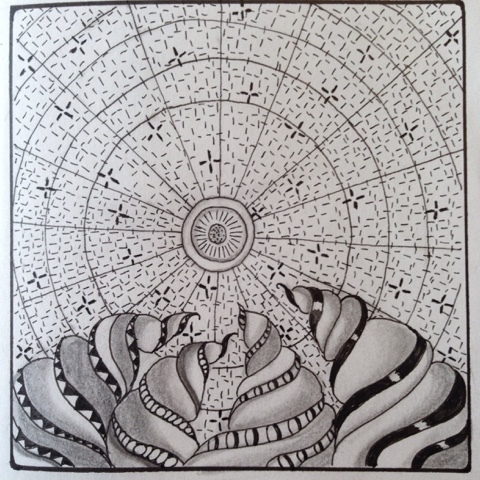 It inspired me to make a zentangle of it. Nice, isn't it ? I used the patterns Narwal and Ahh for it.